A truly impressive gaming machine, with a truly impressive design. It brings high-end portable gaming in a chassis that's minimal and slim. Aorus is a name unfamiliar to, well, everyone, given that Gigabyte has only just launched this new side brand, but if you're looking for eye-catching gaming laptops, you will know it soon. In fact, right now is a good place to start, because the X7 is a hell of a debut. The likes of Gigabyte's own P25W and Toshiba's Qosmio X70 gaming laptops show that you can have impressive performance from a portable machine, but that you generally have to sacrifice a lot of power. 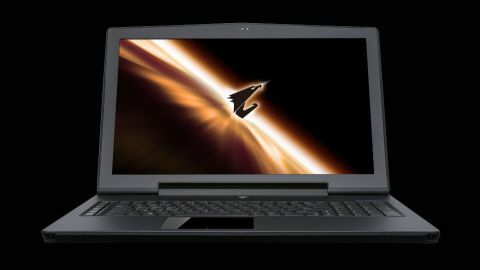 Schenker's XMG C703 laptop is less than an inch thick, but has a considerably weaker GPU than its much thicker sibling, the XMG P703. The C703 still has great 1080p gaming ability, but it's not right at the high end. The simple fact is that if you want a beefy GPU that gives out a lot of heat, you can't have it in a tiny chassis. It's just physics. Well, Aorus doesn't care about physics, apparently. It's put the equivalent power of a Nvidia GeForce 780M into a laptop that's only an inch thick – this is right in line with the most powerful mobile card that Nvidia makes. Only the Aorus doesn't contain a 780M. Instead, it offers two Nvidia 765Ms in SLI, including 4GB of graphics memory. They're matched up with a quad-core Intel processor that's among the best around for mobile use, 16GB of RAM and a Full HD screen. There's even more than 1TB of hard drive space. There's a ludicrous amount going on in the Aorus X7. Perhaps unsurprisingly, then, it's a 17-inch laptop, and a one with a particularly large footprint at that – it might be portable, but you'll need a hell of a bag to carry it around in. At 2.9kg, it's not exactly light either, though we've seen much heavier. What you've got is an all-black body, made of aluminium. It's not quite as solid an aluminium build as Apple's MacBook Pro with Retina display, but it's clearly fairly high quality in general. That said, on our review model, the plastic bezel around the display had come loose already. Though it's generally more understated than a lot of gaming laptops, there is still a certain ridiculousness to its look, which comes from the fan vents. Fitting this much gaming and computing power into a thin chassis means there's a lot of heat to get rid of and not a lot of space to absorb it, so the X7 is COVERED in vents. Two on each side, two on the back, and half a dozen on its underside. Considering what it has to work around, we think the X7 isn't bad looking at all, with the vents at the back suggesting a vague 'spaceship' design, but everything kept as minimalist as possible otherwise. The keyboard includes a macro panel on the left side for gaming, and a number-pad on the right hand side, and the Aorus approach of putting the games first shows through in the fact that the WASD keys have a highlighted edge, so they're easy to spot (although a way to feel them might have been even better, if annoying when typing). Unsuprisingly, all of this doesn't come cheap. Starting at around £1600, you're absolutely paying for the power and effort that's gone into this machine. However, it's not really overly expensive given the specs – it's about in line for what we'd expect given its capabilities.